I'm not sure if this review by the WaPo's Chief Art Critic is a good one or not. There's not much to see in two art projects now on view in Baltimore. That's why it's worth rushing out to get a look at them before they close in the next few weeks. In fact my plebian mind fails to understand the bipolar nature of the points in the review, wondering from negative to positive to negative again, and ending in positive (I think), all the while while seeming to praise the actions of a former art curator heading to the fold of a mad South American dictator while rehashing traditional critical arrows at the heart of art and style as if they themselves were new. I think that Blake may be somewhat brilliant in the way that he managed to confuse me, but then again, I could be wrong. Prepare to be confused here. Jane Rosen: I want to make work that you don't have to have a Master’s degree in Art History to understand. When I lived in St. Martin there was something about the quiet and the water. I became interested in fishing and met an elegant old black man, Mr. Anstley Yarde, who was very tall and thin and had a great presence. He taught me how to fish. You use a can and string. He’d get me at six o’clock in the morning and we’d get these snails. We’d sit on a rock and drop soda-can lines and just sit there. I never caught a fish but he’d catch them. He’d hear them...and I thought, this man has knowledge. And one day, we’re sitting on the rock and he asked me what kind of art I made. I knew Mr. Anstley Yarde would not understand the art I was making at that time, and I realized I wanted him to understand it. It raised that question: who and what does my art address? Who did I want to talk to and what did I want to talk about? ... Theorists will start talking and I’ll start thinking, "O God. I’m illiterate!" But in actual fact, I’m literate about another range of experience, a range they are not connected to. It’s simply not an issue for them! Read the interview with Jane Rosen in Conversations here. I have always thought that the BlackRock Center for the Arts in Germantown, MD has one of the most beautiful and dramatic gallery spaces in the region. With its impossibly tall gallery space, it opens itself to all kinds of great curatorial ideas. I am told that a new gallery director is coming to Black Rock soon, and hopefully the gallery will receive the attention to its web presence and curatorial care to the space itself, that it currently lacks. Currently on exhibition are the paintings of Maryland artist Patricia Di Bella, whose large scale work, and uniformity of size give the viewer quite a good visual reception once one enters the large gallery space. 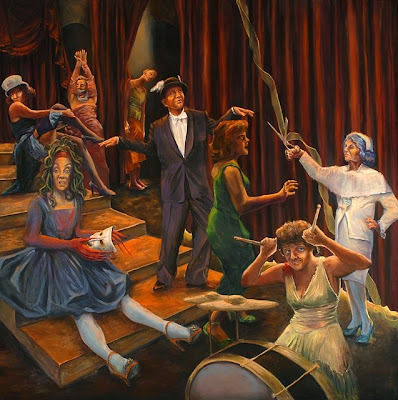 Di Bella's work is a swirl of frenzied theatrical activity and bedlam in a riot of strong brushwork and color impossibilities. 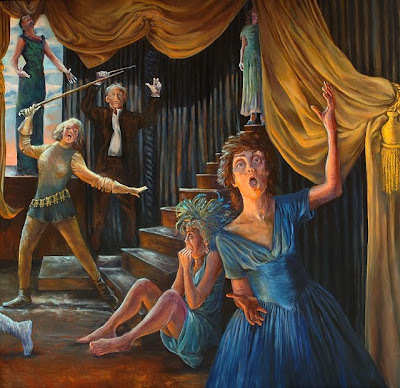 In "Curtain Falls" (see above) we're greeted by an odd cast of characters in what I must assume is some sort of unusual narrative. But I am immediately drawn to the odd character on the lower right hand corner of the painting. 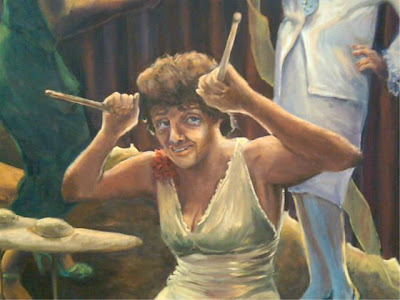 We see a female drummer, in dress and ample cleavage, messing around with the drum sticks and posing with them as horns. Is that Sly Stallone? Is it just me or does that face look like Rocky Balboa? Is it an accident of painting or has Di Bella put the Italian Stallion in there for a reason? I'm not sure, but it certainly adds an unusual twist to this quizzical drama being played on not only on this canvas but also in most of the paintings. What is going on here? What is Di Bella showing us? Is that Bing Crosby crooning some mad song above Rocky? Why does he have wings in his fedora? Is that Monroe with a gag in the rear of the painting? Like any exhibition, some paintings are better than others, and in "Running The Finale" the artist has some issues with her technical facility as we note some issues with foreshortening and proportions. But even those are somewhat overcome by the interesting mayhem going on in the scene depicted on the canvas: it is another madhouse of actions and disturbing emotional ranges. 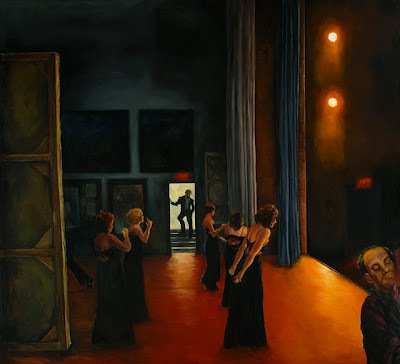 And it is this mayhem on canvas, with Marilyn Monroe being oddly referenced everywhere, that seems to be the unifying point in most of the work, with possibly the exception of "Sound Check, Teatro Diego," which appears to be a very intelligent homage to Diego Velázquez's "Las Meninas." A bravo to the artist for referencing what is (in my opinion) the greatest painting of Western civilization; it is not an easy task. BlackRock Center for the Arts is located at 12901 Town Commons Drive, Germantown, Maryland 20874. Call them at 301.528.2260 for more info.